When I was a child, I loved to visit an elderly neighbour who collected little things. If I were seated, my hands were clean, and I promised to be very careful, she would let me hold and examine them. There were tiny tea sets, dolls, and miniature ornaments from all over the world. I think most kids are fascinated with tiny. Here's an idea to get them involved in story as well. Find a special box. Collect small things for it. Encourage your kids to use those things as props to tell, or write stories. You could consider including found objects like lovely stones, shells or seed pods, tiny books, small toys, blocks and bricks, plastic animals and characters, puzzle pieces, cookie cutter shapes, cake decorations, finger puppets, anything small that might stimulate interest, curiosity and creativity. The box ideally should have a way to fasten it, so you won't lose the bits. 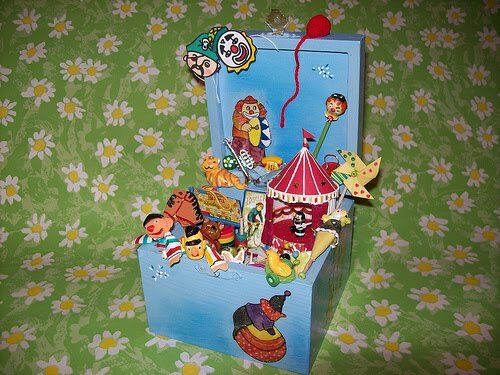 I've used story boxes with special themes like Zoo, Circus or Pirates. It's also nice to keep a special notebook and pencil handy, for jotting down stories urgently. This activity is ideal for young kids who love to handle objects and relate well to them. If you want a challenge for older kids, consider having them close their eyes to choose something from the box, then describe it aloud. They might choose three objects without looking and invent a story based on them. Or they could write a description of one object, without naming it, and see if someone else can recognize it from the description. With older kids too, you could try a story box in which you keep pictures for story prompts, or ideas for plots, characters and settings. Update: There's a lovely post on Learning Parade called Small World Settings that gives great ideas for items you could incorporate into your story box. What a lovely, lovely idea. Love this idea - I teach high school, but sometimes it's fun and encouraging for the older students to get to play with stuff like this as well, after all, writing should be about play! Totally agree, Charmaine. In fact I use a story box with adult writers too. It's such fun to watch the memories and suggestions that are brought up. So glad you like it, Catherine, and I hope you'll try it with your kids and let us know how it goes. lovely idea - similar to a counselling technique called Sandtray or Symbol work where the client is shown an array of symbols (all sorts of minatures usually arranged on wide open low shelves ) and then place them in a sandtray and talk about what they have created, what the symbols may represent, why are they placed where they are, anything to change, anything that repelled that they didnt want to choose, all sorts of things like this. I know sandtray therapy and always loved doing it myself, Michele. Also liked playing in the sandbox when I taught Kindergarten! Handling and musing over objects is a very powerful imaginative tool. I hope your kids love it! Love this idea sooooooo much! Last Easter we purchased faith eggs, each with a little something in side to tell a story over 12 days... it was lovely. Kelly, that reminds me a little of Kinder Surprise. To they still make them? There were cute tiny toys inside a plastic eggish shape. I think a bag would be great for the car, but I agree, Green Mama. I can just see a special box decorated in some way, maybe a pirate chest or one with a cunning lock. YES! Toys inside each plastic egg and a book to read. The children thought it so special. I can see it becoming a tradition the children will remember. Here is where you can buy them. Very cute. I love that there is reading involved too! I was going to mention the Learning Parade post. Now I am inspired to make small scenes AND story boxes. Thanks for the idea. I look forward to seeing what you and your kids create, Ian! Carly, that's a huge site and looks to be packed with excellent resources. Thanks so much for sharing it! Ooohhh, I wish my children were still little! No matter, I'll start my story boxes now and be ready for my grandchildren (in another 10 years or so...). Thanks for the magical idea! Story IS magic, isn't it, Eva. Opening kids' eyes to its possibilities is about as magical as it gets! This story box sounds fun. I think my granddaughter might like this. Hi Ruth! Yes, I know the blog. Stacey was involved in 2010's Share a Story-Shape a Future blog tour that I helped organize. Theirs is a great blog with so much information for teachers. This is fantastic! You're right about kids being fascinated with tiny little objects. My boys would love this! The thematic boxes would be so much fun as well.